PT55,PT65,PT85,PT100 Always check the model number on your machine and the type of tape it uses. 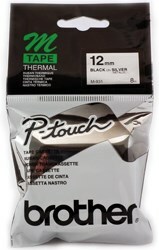 There is a range of P-Touch labeling machines and a variety of tapes to choose from. Easily installed, please refer to the owner's manual for these instructions. Brother non-laminated tape with standard adhesive is great to use indoors for hobbies, organising, or crafts, available in two different sizes and a plethora of colors you will be able to find one for your exact need. Two different size widths allow for endless possibilities.